Not everyone was happy with the "swipe-up" to open the options menus (for devices that lack a menu button, or that broke the legacy options menu altogether), so I decided to simply implement an on-screen button instead. I also improved the graphics in the on-screen buttons for navigation, something that as long overdue. The result is shown below. The right-most button with the horizontal lines opens the new-style options menu. As before, the other buttons are used for navigating the game, see the manual for details. On devices that still support a physical or virtual menu button (vertical dots in the screen-shot below), that button opens the legacy options menu. Expect a similar update for Reversi and Checkers for Android soon too. 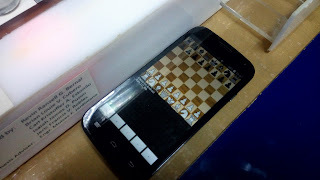 A while back I got an email from Isaiah James D. Puzon, a computer engineering student at the Philippines FEU Institute of Technology, with a minor request for a new feature in Chess for Android that would help with his thesis project: a chess-playing robotic arm. It was very rewarding to receive pictures from his exciting working prototype a few months later. You did a great job building this robot arm, Isaiah. Congrats with your graduation and good luck with your further career! 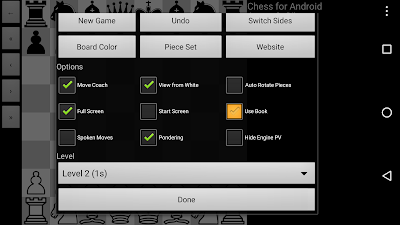 I got several questions on how to use the opening book features in Chess for Android, so I hope this blog posting will be useful. By default, the GUI uses a built-in opening book before it consults any chess engine, either the built-in Java engine, or an imported third-party chess engine. This small built-in opening book (consisting of few opening lines I studied a long time ago as a young member of a chess club, by the way) provides some variety of play, but otherwise is probably not sufficient for the more serious chess player. Therefore, before using an engine's own opening book, one has to disable the GUI opening book, by disabling the "Use Book" choice in the options menu, as shown below (touch to remove the check mark).